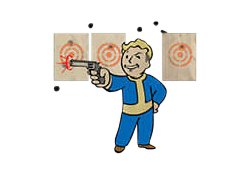 Gunslinger is a Perk in Fallout 4. It is associated with the Agility Stat. Rank 2: Non-automatic pistols now do 40% more damage and have increased range. Rank 3: Non-automatic pistols now do 60% more damage and range is increased even further. Rank 4: Non-automatic pistols now do 80% more damage and their attacks can disarm opponents. Rank 5: Non-automatic pistols now do double damage. Their attacks have a much better chance to disarm opponents, and may even cripple a limb.